Parkir bayar 65rb sangat memberatkan. 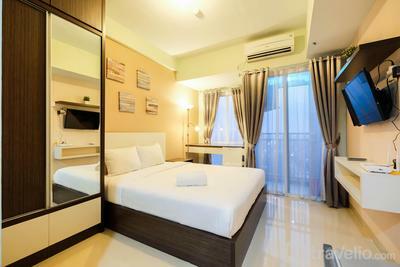 Tolong dibuat solusi spt tempat lain ada yg free ato pake pake harian cm 20rb akan lebih baik..
Halim Perdanakusuma Airport is 18,7 km away from this apartment building and could be reached by driving for 32 minutes; 1 hour 8 minutes to Soekarno Hatta International Airport (60,4 km); 6 minutes driving (1,8 km) to Mitra Keluarga East Bekasi Hospital. Transportations access such as East Bekasi Toll Gate (2,2 km) and East Bekasi Station (3,3 km) could be accessed by 9 minutes driving through different routes. Nearest shopping center to Grand Dhika Apartments could be your alternative entertainment option such as Bekasi Town Square which could be reached by 8 minutes driving (2,6 km); 9 minutes driving (3,4 km) to Blu Plaza Bekasi Mall; 11 minutes driving (2,7 km) to Carrefour East Bekasi; 13 minutes to Bekasi Trade Center (3,9 km), Metropolitan Mall Bekasi (5,8 km), and Lotte Mart Wholesale Bekasi (6,6 km); and Grand Metropolitan Mall could be accessed by 15 minutes driving (5,8 km). Another recreation options are Colombus Waterpark which could be accessed by 15 minutes driving (4,7 km), and Venetian Water Carnaval could be reached by 21 minutes driving (6,5 km).